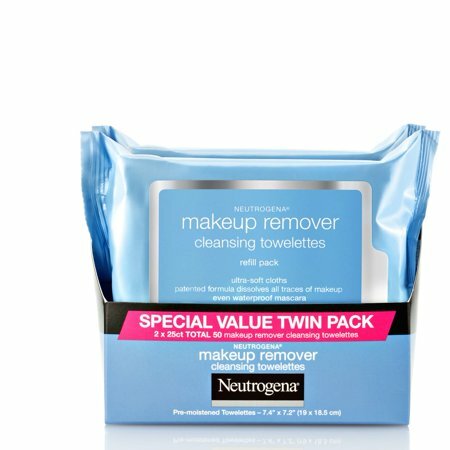 Neutrogena Makeup Remover Cleansing Face Wipes, 25 Ct, 2-pack. Total of 50 pre-moistened makeup remover cleansing face wipes. Gentle enough for sensitive skin. Patented formula dissolves and removes all traces of makeup -- even waterproof mascara. Ingredients: Water, Cetyl Ethylhexanoate, Isostearyl Palmitate, Pentaerythrityl Tetraethylhexanoate, Isononyl Isononanoate, Cyclopentasiloxane, Hexylene Glycol, PEG-4 Laurate, PEG-6 Caprylic/Capric Glycerides, Sucrose Cocoate, Carbomer, Sodium Hydroxide, Benzoic Acid, Dehydroacetic Acid, Phenoxyethanol, Lodopropynyl Butylcarbamate, Fragrance. Instructions: Gently wipe face with towelette, removing dirt and all traces of face and eye makeup. There is no need to rinse. Dispose of the towelette in trash receptacle (do not flush). After removing towelette, reseal refill pack. If stored in vanity case, secure lid. ...very difficult to work with. It is tender to the touch of everything and I get sensitive spots that burn. To find this product made my life so much easier. I can now wear a very light rouge I never dared try. Bless these products. I have been using this product for years and love it. Removes stubborn eye make up and avoids staining washcloths. I had been using a liquid makeup remover, and after using it, my eyes would get red and irritated through the next day. I began to think that getting all that dissolved makeup into my eyes was the problem. A Neutrogena Towlette removes ALL makeup, including eye makeup, but because it is not a liquid, very little gets into my eyes. This is a much better product for me to use... not sticky, no heavy perfume, and it works! PS I do NOT use waterproof mascara, so I don't have any comment on that. I started to look for cheap but good makeup wipes about 6 months ago and found this, it's really good, removes all of my makeup. It leaves a little bit of an oil residue but I don't really mind as I wash my face tight after. Removed waterproof makeup easily. Thanks for the review! So glad you love these cleansing towelettes, but we wouldn't expect them to leave an oily residue. Give us a call at 1-800-582-4048 so we can learn more. We're open Monday - Friday from 9:00am to 5:30pm ET. We look forward to chatting! I wear a lot of makeup because I am a full glam kind of girl. These makeup remover wipes really do a amazing job at taking off my makeup. My face feels softer after and I don't have to scrub to get my makeup off. I highly recommend these wipes to anyone who wears makeup. Is this pack fragrance free? 1. The wipes do not have any distinct or obnoxious smell. 2. I have used this product for years but honestly can say, I don&#39;t know but I don&#39;t notice any fragrance. 3. No it&rsquo;s not fragrance-free but not overpowering. Removes all makeup completely. 4. No, but it has a very mild clean fragrance. 6. Excellent product and fragrance free..
7. Hello, these wipes do come in a fragrance-free version. It will be noted on the front of the packaging to ensure you chose the correct product, as our regular wipes do have a fragrance. 8. No, these contain a fragrance.